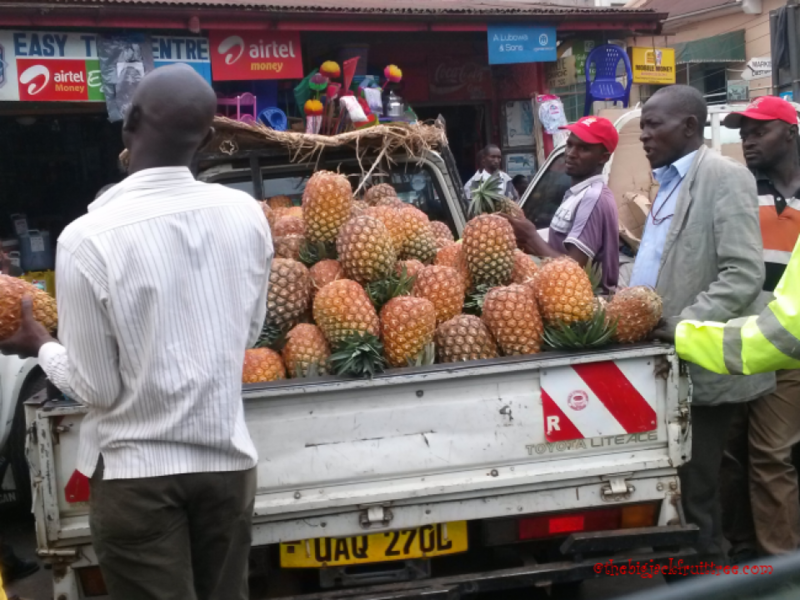 Ugandan Pineapples are the best…. 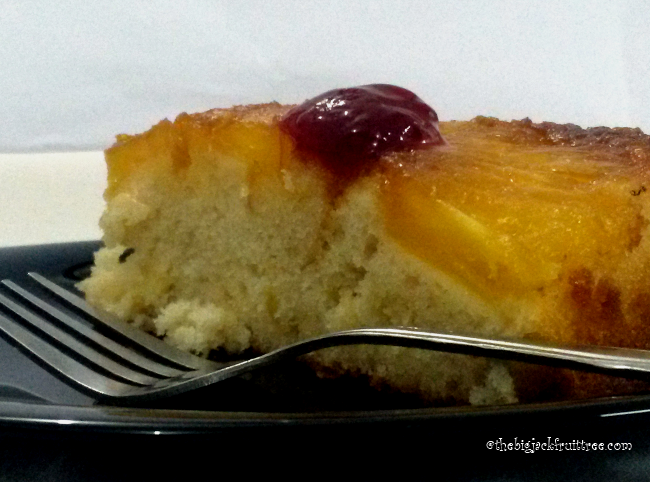 This time when I put my baker’s hat on, pineapple upside down cake – the glistening, sticky sweet top of pineapple slices on top of a simple white cake, came into my vision. This sweet top lifts the simple white cake up a notch. In the US, pineapple upside down cakes became popular in the 1920s when canned pineapples were easily available for reasonable prices while fresh ones were difficult to find and if they were available, they were very expensive. The widespread availability of canned pineapples owes to Jim Dole of Hawaiian Pineapple Company who canned a major chunk of pineapples available. 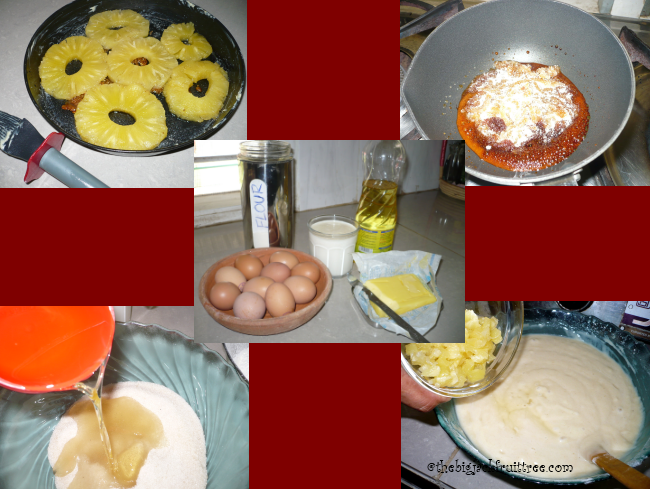 Traditionally pineapple upside down cakes were made in cast iron skillets on top of the stove. 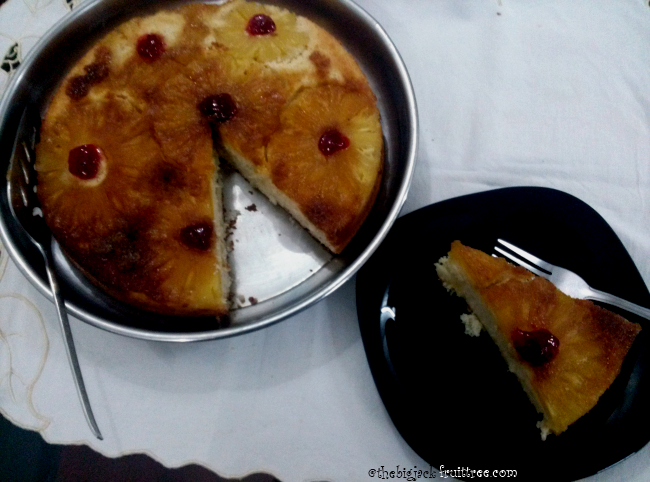 When you bake a pineapple upside down cake in Kampala, it’s criminal to use canned pineapple since pineapples grow in plenty in Uganda and are currently in season. Not only the quantity but the quality is also topnotch. 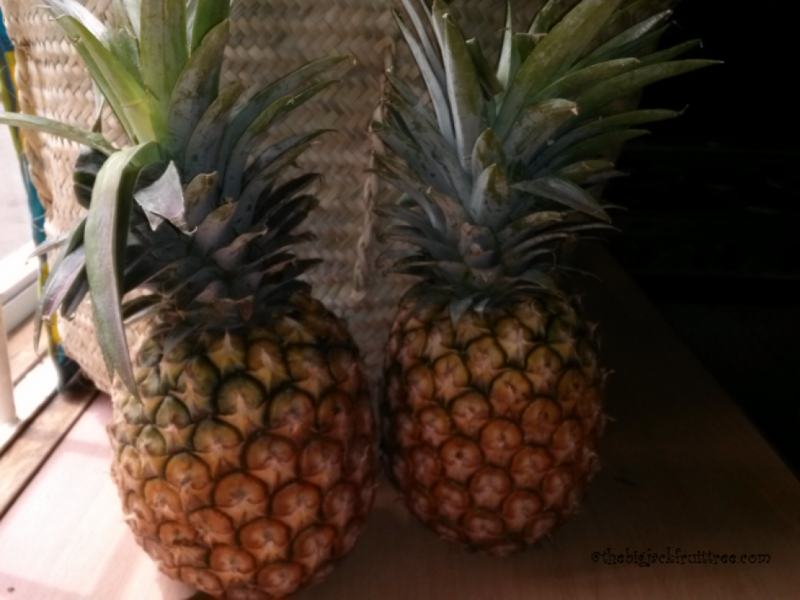 The pineapples are sweet, succulent and big. 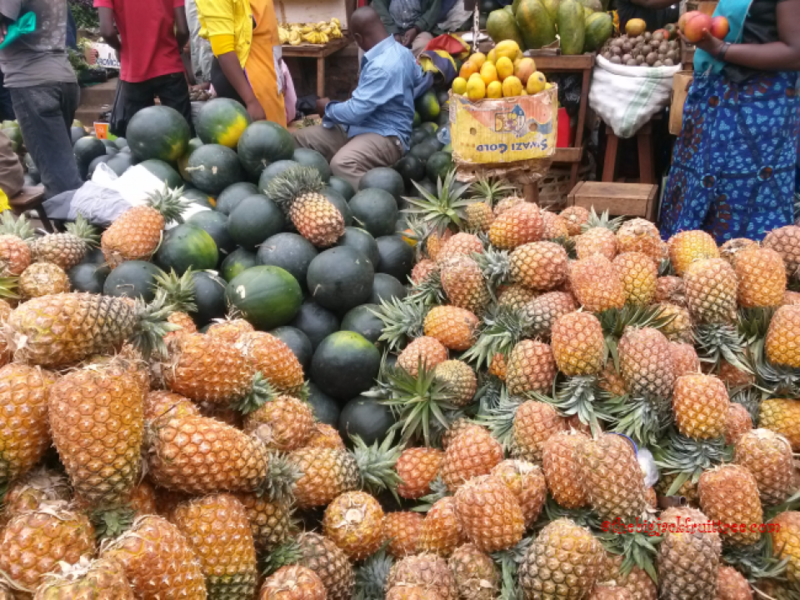 The skin/crust of Ugandan pineapples are hard and hence has a longer shelf life. 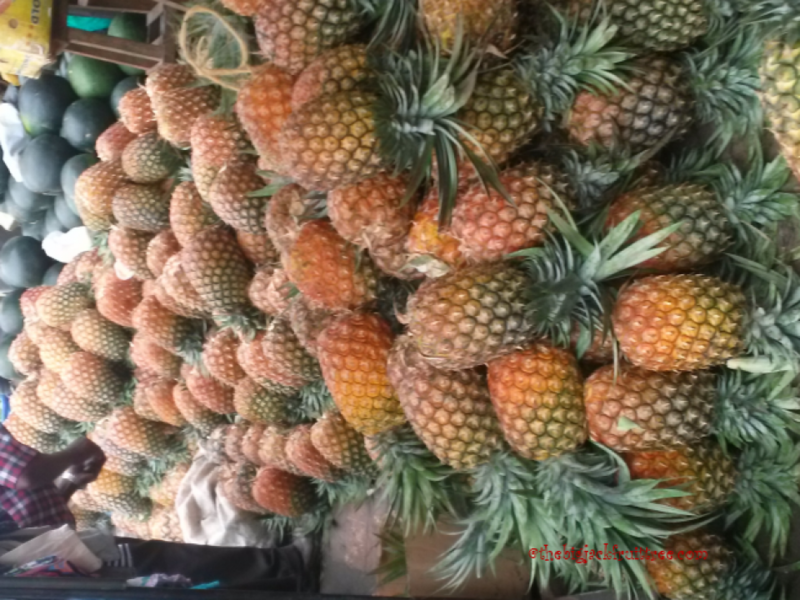 Read what Ms. Salima Njeri, a Kenyan trader says about Ugandan pineapples. 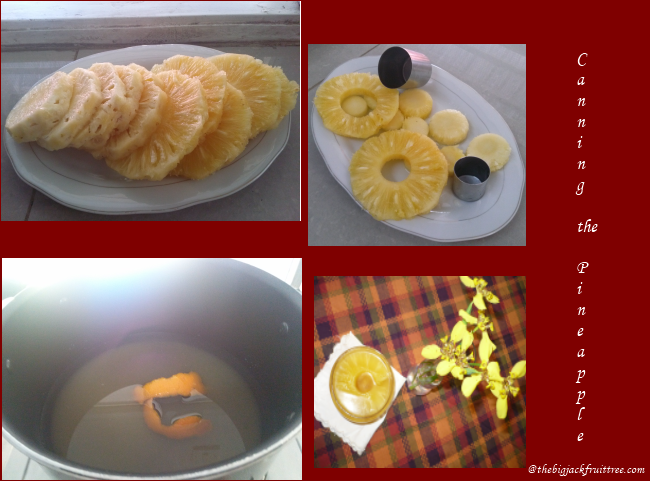 As I was little apprehensive about using fresh slices of pineapple instead of canned as it can make the batter watery. So I tried my hand at canning the pineapple slices which I did the day before baking.Peace, my house help helped me in peeling and slicing the pineapple. If you are not skilled at peeling whole pineapple, I suggest cutting it into rings after cutting the crown and stem off. And then cut the skin off holding each slice . The core can then be removed using a cookie cutter or any sharp cylinder of right size. Sugar syrup is made using sugar and water in a ratio of 1:2 as these pineapples are really sweet and will be used up in a day. If the slices have to be kept for long use a syrup of 1:1 ratio. For any upside down cake the fruit and brownsugar are placed on the bottom of the pan before batter is poured in. But here caramelised sugar is used instead of brown sugar. Oil and yoghurt are used instead of butter in my cake recipe. In pineapple upside down cakes a glazed cherry each is placed in the middle of each slice where the core of the pineapple was. Since there were no cherries in stock in my pantry I’ve decided to bake mine without it as cherries wouldn’t add on in any way to the taste of the cake. But later once the cake was turned upside down,I realised that it was not very appealing to look at. Voila! here’s the final product. Red Plum jam came to my rescue. 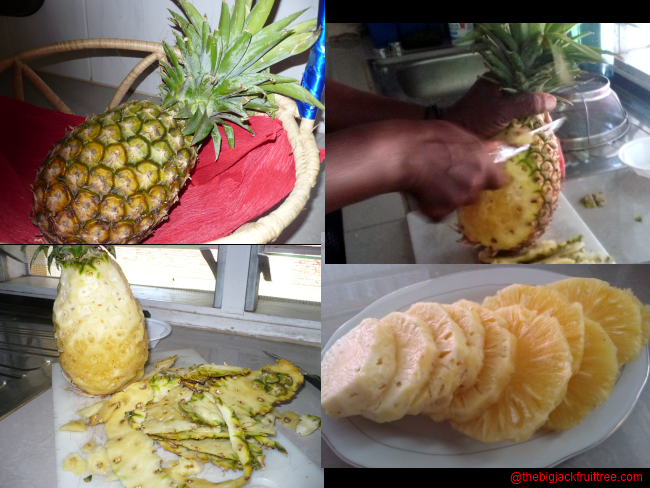 Skin the pineapple, cut into 1 cm thick slices and remove the centre core. Heat sugar and water ( add orange skin as well if it’s used ) together till it starts simmering. Transfer the prepared slices into the syrup and keep it in a waterbath and cook for 45 minutes with a lid on. Remove from the waterbath and cool. Cooking of the pineapples can be done in advance. Prepare a 10 inch / 25 cm tin by buttering the base and the sides. But flour only the sides. Heat the sugar for the base till it caramelises. Add 1 tablespoon warm water and heat it again to get pourable consistency without any solid bits. Pour into the prepared tin and spread it on the base of the tin by tilting it. Arrange the pineapple slices in a circular manner with one in the middle. Sift the flour, baking powder and baking soda together twice. Beat sugar, oil and yoghurt together till till creamy and mixed well. Now add one third sifted flour, mix well. Add half of the syrup, followed by half of the remaining flour. Beat till the flour is just mixed. Add the remaining syrup and flour and mix again. Once all the flour is incorporated mix the batter well for 4 minutes using a wooden spoon. If an electric hand mixer is used, attach the whipping attachment and beat for 3 minutes in medium speed. Transfer the batter to the prepared tin and bake for 35 minutes or until a wooden skewer inserted in the centre comes out clean. Thank you, Hema. Happy to note that you enjoyed reading the post. This looks great. Is there a substitute for eggs? Lakshmi, I shall post a recipe for an eggless cake soon. Looks amazing! 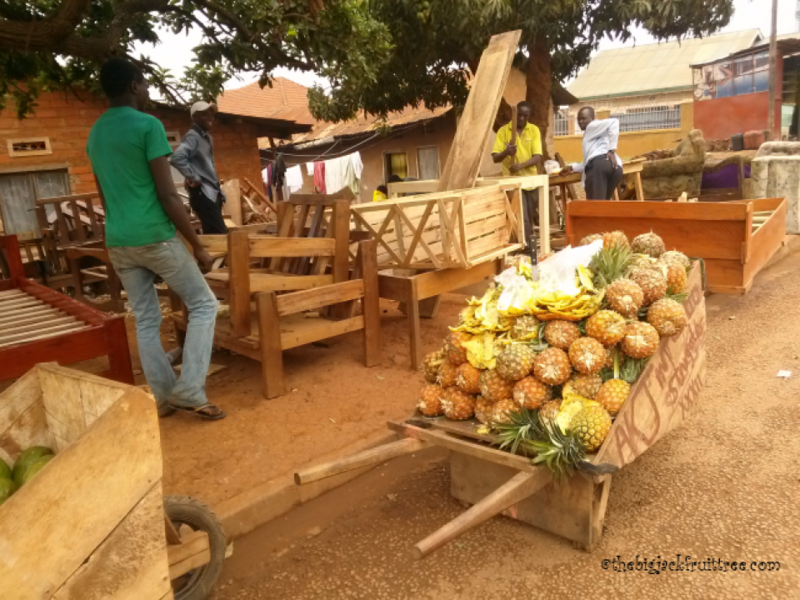 Love the photos at the top of pineapples being sold! Nice to know that you enjoyed the post. Watch this space for more on Uganda.